InDependent and The Army Wife Network launch registration sign-ups for the first ever online Military Spouse Wellness Summit. The free online summit takes place Oct. 19-23. Summit participants will receive 10 interviews from health, nutrition, fitness, and financial experts specially recruited for the summit to help inspire military spouses to thrive. 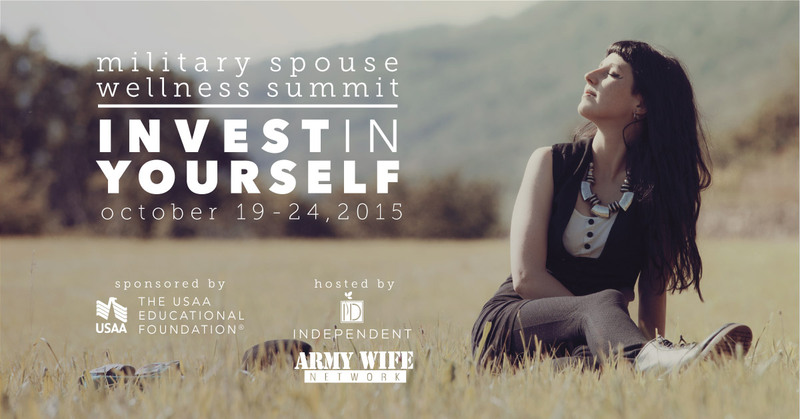 FORT RILEY, Kansas — InDependent and The Army Wife Network launch registration sign-ups for the first ever online Military Spouse Wellness Summit: Invest in Yourself 2015 sponsored by The USAA Educational Foundation. The free online summit takes place during the week of Oct. 19-23, with a bonus day on Saturday when the grand-prize winner of a wellness-themed SpouseBox will be announced. Summit participants will receive 10 interviews from health, nutrition, fitness, and financial experts specially recruited for the summit to help inspire military spouses to thrive. Military spouses can register at http://in-dependent.org/wellness-summit. All summit registrants will receive a FREE one-year membership to Thrive Market ($49 value), plus one-week of virtual health training by: Fit.Active.Toned. Everyone who registers for the event will also be eligible to win exclusive giveaways. The Army Wife Network is a core team of new and seasoned Army wives and military community members on a mission to empower the journeys of those who follow. AWN boasts the original internet talk radio show designed specifically for military spouses — Army Wife Talk Radio — in its ninth year of broadcasting, over 84,000 Facebook fans, and one of the longest running military spouse blogs on the internet. Please go to http://armywifenetwork.com/ for more information about AWN. InDependent and The Army Wife Network news release. Story originally published at http://www.army.mil/article/155447.